With this plugin you can easily merge two users together. See this topic for more on installing plugins. Awesome! To clarify… does this replicate the rake task exactly? Eg Does the email address of the deleted user move to the secondary email of the retained user? It calls the same library that the rake task does, so yes the results are exactly the same. 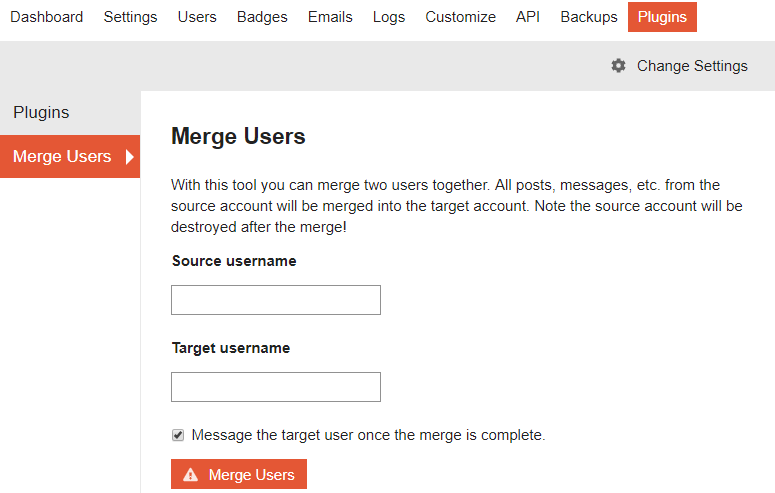 Oh, except for one cool new feature, it sends a message to the target user once the merge is complete to let them know! Nice! Can that message be optional? I do not always want to inform them. Hmm, I’ll have to think about that. I feel like it should notify them, as it’s their account. If it’s important they not be notified for some reason, the rake task is still a good option. But if a lot of people do want it to be optional, it wouldn’t be too hard to change it. Merging users has some very particular data protection implications, it’s probably safer to always notify. It’s also not reversible so if you do it by accident… there’s no way to undo that. Yep, another reason that it’s probably worth always explaining what happened. That makes me think of a good enhancement I could make. It currently puts up a confirm dialog saying “Do you want to merge source into target?” But I could also make it show their avatar and display name as well, just in case someone thought they had the right username but would recognise through the avatar that they have the wrong one. I think that is an excellent idea and also mention it is permanent! I feel like it should notify them, as it’s their account. If it’s important they not be notified for some reason, the rake task is still a good option. I don’t diagree with what you are saying here. And I am sure it makes sense for other communities. In my community I often have to do merges because people were invited as staged users, then they ended up joining using a different email address which creates a second account. In this case it is of no interest to the user and notifying them will just confuse them. I also have a canned reply I use regularly to personally explain what I did when I do a merge like I have for many account related tasks. I don’t really need or want an automatic notification to help me with this. I can continue using the rake task but other people on my team do not have shell access and it would be nice to be able to delegate this task to them using your plugin. This plugin does use the standard text template system, so you could change the message it sends to your current canned reply. Would that work for you? Not really - like I said, I don’t always send it and when I do I write it myself using the canned reply. We do not edit the default out of the box translations in discourse at all, and don’t want to start doing that now just for this task. I guess for now I will just keep using the rake task, but I’d love to start doing it via the UI so I can delegate it to colleagues who don’t have shell access. My strong preference would be for your plugin to have an admin setting to disable this automatic message entirely. Well as @codinghorror keeps liking your posts, I’ll take that as a sign that it would be okay to make the messages optional. But probably as a checkbox on the form rather than a setting. Or maybe both. But I could also make it show their avatar and display name as well, just in case someone thought they had the right username but would recognise through the avatar that they have the wrong one. I like that, but I think I would go a bit further here. This operation is permanent there is no way to unmerge accounts. This is definitely going to be a core feature at some point, we just need to find the right time and have all the safeguards in place. Hmm, I do like the look of that! But I’m just using bootbox.confirm at the moment which is nowhere near that flexible. Any pointers on how I could create a custom dialog? Or an example from elsewhere in Discourse that I could look at? You are going to need a modal for that it is not the easiest API in the world, but there are lots of examples in core (like modal/flag.hbs) and so on. This is an excellent mockup but you should need to type the username to confirm the merge, otherwise you’ll just remember to type YES every time. In my case, email address is an important aspect of mergers. So maybe this could be expanded to e.g. Perhaps overkill, but if we’re already talking about a modal it might be a nice addition here to be able to choose the username and email address to retain for the user, and which email address (if any) to be kept as secondary. Which user, or both? The admin already did have to type in the usernames before. I’m not opposed to this, but choosing only one feels kind of arbitrary when it’s a major operation that affects two people if it’s done mistakenly.